Assessment is a systematic and ongoing process of gathering, analyzing, and using data to improve student learning, educational and support services, and operational processes. Who is Involved in Assessment at TAMIU? All academic programs, educational services, and administrative offices at TAMIU identify expected outcomes and annually assess the extent to which outcomes are met. Assessment results are used to drive continuous improvement, ensuring the institution provides a high quality education while complying with the SACSCOC Principals of Accreditation. The Office of Institutional Effectiveness coordinates the assessment process, provides ongoing support through workshops and individualized sessions with faculty and staff, and regularly updates resources. The assessment process includes four essential steps: 1) planning, 2)data collection, 3) data analysis, and 4) use of results for improvement. The diagram above highlights the continuous nature of the process. The purpose of assessment in academic programs is to effectively measure to what extent student learning outcomes are achieved. Assessment initiatives help programs use data to improve student learning and better prepare graduates for life, work, and leadership roles. All degree-seeking programs are responsible for submitting annual assessment plans and final reports to Basecamp—the university’s temporary assessment management system. Program faculty meet in the fall to discuss prior assessment results and review program learning outcomes, measures, and criteria for success, as well as assign data collection responsibilities. Program coordinators upload assessment plan to Basecamp. Responsible faculty gather assessment data throughout the assessment cycle and submit to the program coordinator. Program faculty meet to discuss and analyze assessment results in the spring. Program coordinators submit final assessment report to Basecamp. Programs utilize data in a meaningful way to improve and enhance student learning. The Quick Guide provides guidance on closing the loop. Check out the Assessment Quick Guide to get started. The purpose of AES assessment is to promote the continuous improvement of administrative services, educational services, and university operations to better serve the needs of our students and community. All administrative units and student services are responsible for submitting annual assessment plans and final reports to Basecamp, TAMIU’s temporary assessment management system. Each AES unit is responsible for reviewing its mission, objectives/outcomes, and assessment plan annually. Each year, expected objectives/outcomes, assessment measures, performance targets, and individuals responsible for data collection must be identified. The plan provides guidance and focus for assessment efforts throughout the year. 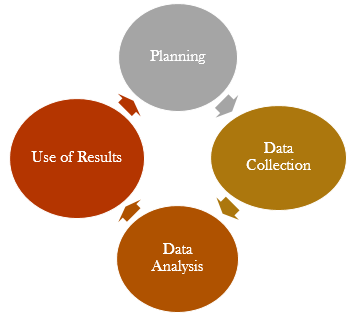 Depending on the measures identified in the plan, data may be qualitative or quantitative. Data collection can happen on a scheduled or ongoing basis, as long as data for each measure is collected at least once during the assessment cycle. Following data collection, each AES unit is responsible for closely reviewing its data and determining the extent to which operational objectives, learning and development outcomes, and/or program goals were achieved. Results must be provided in the final report. After data is analyzed, AES units are responsible for the most important phase of the assessment process--discussing what assessment results mean in relation to improvement of operations and services and implementing appropriate changes based on the data. The Texas A&M International Core Curriculum, in compliance with the Texas Core Curriculum, is a set of common courses that are required of all undergraduate students and are considered the necessary general education for students, no matter their choice in major. The Core Curriculum ensures that students will be provided with the essential knowledge and skills to succeed in college, their careers, their communities, and in life. Through the core curriculum, students will (1) gain a foundation of knowledge of human cultures and the physical and natural world, (2) develop principles of personal and social responsibility for living in a diverse world, and (3) advance intellectual and practical skills that are essential for lifelong learning. When is the Core Curriculum assessed? This page is currently under construction. We apologize for the inconvenience. Please check back this summer!